Flood insurance policy holders in the special flood hazard area (SFHA) receive a 15% discount on their policy. Standard flood policy holders outside the SFHA receive a 5% discount. There is currently $1.1 billion of flood insurance coverage protecting property owners in Doral at an annual cost of $1.8 million. The discounts represent an annual savings of more than $280,000. *CRS is a voluntary program however compliance with all NFIP regulations is required to maintain eligibility for flood insurance, flood insurance discounts, FEMA public disaster assistance, and FEMA grants. In 1968, Congress created the National Flood Insurance Program (NFIP) to provide affordable flood insurance to individuals who live in areas with the greatest risk of flooding called Special Flood Hazard Areas (SFHAs). The SFHA is that portion of the floodplain subject to inundation by the base flood (1% annual chance) and/or flood related erosion hazards. The SFHAs are typically depicted in the new format Flood Insurance Rate Maps (FIRMs) as Zones A, AE, AH, AO, AR, A99, and V. Development may take place within the SFHA, provided that development complies with local floodplain management ordinances, which must meet the minimum Federal requirement. The NFIP makes federally backed flood insurance available in communities that agree to adopt and enforce floodplain management ordinances to reduce future flood damage. This is important because property owners who hold a federally backed mortgage must purchase flood insurance if the property is located within the SFHAs. During the rainy season, the continuous downpours saturate and, on occasion, over saturate the ground; reducing the capacity of the Stormwater Drainage System. This may cause some temporary flooding along city streets and/or private property, creating potentially dangerous conditions. … that floods are the most common natural disaster? Your property may be located in a SFHA. To determine the flood zone for your property contact the City of Doral Building Department for a flood zone determination at 305-593-6700 or Use Doral 311 first enter the address, then in the service area choose “BUILDING”, then in the service type choose “Flood Zone Determination”. … and even if you’re not in a SFHA (Special Flood Hazard Area), FLOODS HAPPEN. Mother Nature doesn’t know how to read FIRMs (Flood Insurance Rate Maps). Even Zone “X” is STILL a low-risk flood zone.… and even if you’re not in a SFHA (Special Flood Hazard Area), FLOODS HAPPEN. Mother Nature doesn’t know how to read FIRMs (Flood Insurance Rate Maps). Even Zone “X” is STILL a low-risk flood zone. 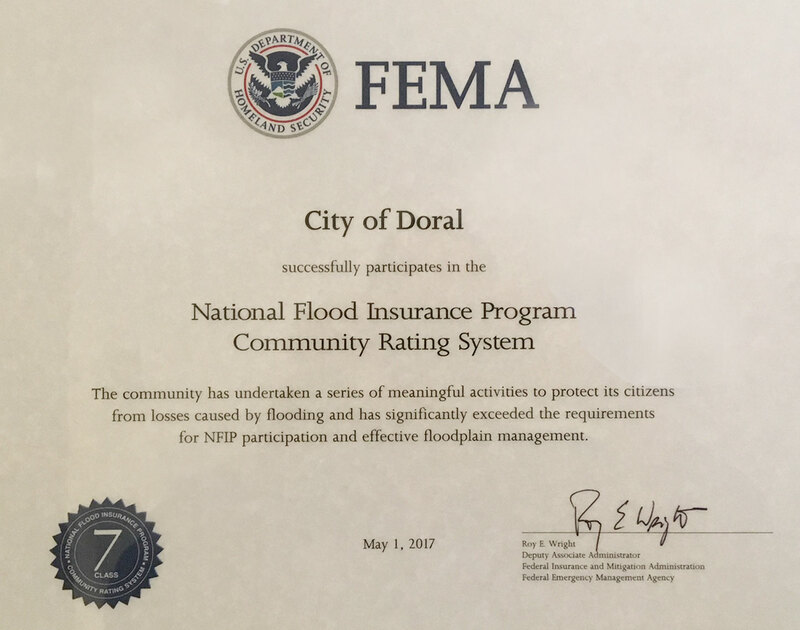 The City of Doral is currently rated at a “7” in the CRS (Community Rating System) Program and policyholders receive a 15% discount on insurance premiums for properties in the SFHA (5% in non-SFHA) due to the City’s participation in the program and strict enforcement of the floodplain ordinance. Did you know that Homeowner’s and/or windstorm insurance does not cover flood damage to a structure? Federally backed mortgages (FHA, VA, FNMA etc.) and most private mortgages (Conventional) require flood insurance. In the event that your mortgage does not have this provision or if you own your property free and clear, you should still consider purchasing flood insurance. Remember, there is a thirty (30) day waiting period before the policy becomes effective. There are two exceptions: (1) If the initial purchase of flood insurance is in connection with the making, increasing, extending, or renewing of a loan, there is no waiting period. (2) If the initial purchase of flood insurance is made during the 13-month period following the revision or update of a FIRM for the community, there is a 1-day waiting period. The City participates in the Community Rating System (CRS), which provides discounted flood insurance rates on all policies written in the City. Here are some safety tips to consider, if you are ever faced with flooding. If you are advised to evacuate, turn off all utilities at the main switches or valves. Disconnect electrical appliances, but do not touch any electrical equipment if you are wet or standing in water. Designate a place where your family can rendezvous if an evacuation order is issued. Rehearse your evacuation plan with all household members. Plan to leave early to avoid traffic delays. Drowning is the number one cause of flood deaths. Currents can be deceptive; six inches of moving water can knock you off your feet. Look before you step. The ground and floors may be covered with debris and mud. If you walk in standing water, use a pale or stick to ensure that the ground is still there. Stay away from power lines and electrical wires. Electrocution is the number two flood killer. Electrical currents can run through water. Report downed power lines to Florida Power & Light at (305) 442-8770. Do not attempt to drive through large puddles or moving flood waters. Do not disregard road barriers, the road or bridge may be washed out. Look out for animals, especially snakes that may have been displaced by the flood. Be alert for gas leaks. If you use natural gas, use a flashlight to inspect for damage. Do not smoke or use candles. Remember to arrange for your pets. Most evacuation centers will not accept pets. Make plans in advance to board your pets in a kennel or with friends outside the hazard area. Place sandbags or similar barriers between floodwaters and your structure. Place your valuables and important papers in a plastic bags or waterproof containers and relocate them to the highest floor. Secure your boat. If possible, store it inside a garage or warehouse. If outside, make sure the boat is secure to the trailer and the trailer is tied down. All new buildings or renovations to existing buildings require permits. These permits must be obtained prior to commencement of construction activities. Before you build, alter, re-grade, or fill your property contact the Building Department at 305-593-6700. If you see any building or filling without a permit posted, please call our Code Compliance Department at 305-593-6680. Proper drainage helps reduce the risk of flooding. It is illegal for the direct or indirect entry of any solid, liquid or gaseous matter into the drainage system other than rainwater runoff. The City periodically inspects the drainage system and regularly schedules debris removal operations in order to keep the drainage system at peak performance. You can help in this process by keeping the streets clear of materials and debris that could potentially affect the drainage system. Please report any illegal dumping activities that may affect drainage and/or contaminate the ground water to the Public Works Department at (305) 593-6740. For more information regarding flood damage prevention, insurance needs and requirements please call the City of Doral Building Department at (305) 593-6700. The City of Doral flood protection assistance program provides information on property protection, how to obtain funding for your flood mitigation project, and can perform a site visit to determine possible flood hazards. For more information please contact the City of Doral Building Department at 305-593-6700 or building@cityofdoral.com.